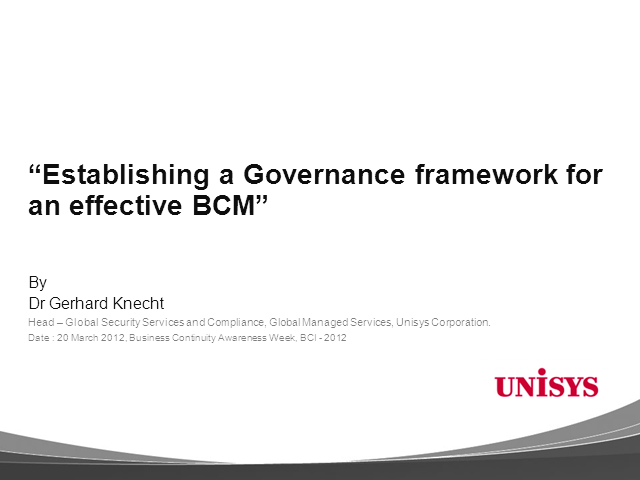 One of the most important aspects of running a BCM program is having an effective governance structure. Without this, the BCM program cannot achieve its desired results. While there are multiple governance models which are suggested by various industry accepted frameworks, it becomes imminent to adopt and customize the one most suited to your line of business. This also has to consider the unique dynamics of the organizational functioning. We at Unisys, believe that there are three heads, around which a governance framework could be designed - Strategic, Commitment and Culture. In this webinar, we will share our opinion on the ways to device a governance framework, its important elements, the step by step approach to establish a BCM governance structure. This can be applicable to most organizations, both large and small and in various industries. A very vital aspect of BCM governance is establishing performance indicators which are then used to understand the effectiveness of the BCM program. These indicators are often reported to the management for their attention and most importantly, their support. During this webinar, we will also discuss at length on the various ways and examples of performance indicators. These indicators vary from revenue based models to resiliency based models. Finally, establishing a governance structure also comes with certain challenges. A few of the most important challenges which will have a bearing on the BCM governance will be discussed. This will help in understanding the causes of most challenges which can then be factored while implementing BCM.